The bag you travel with can really make or break your trip. I’m sure we can all agree that traveling with a well-made bag that is comfortable to carry and easy to use is way more enjoyable than battling a poorly designed bag that might fall apart on you at any moment. Duffel bags can be a great alternative to backpacks, being easier to access your things and stuff into awkward spaces. Some duffel bags now come with wheels! Wheeled duffel bags might just be the most genius of inventions, combining the convenience of wheeled suitcases with the duffel style we know and love. This article lists 11 of the best rolling duffel bags on the market right now, so you won’t have to look far to find one for yourself! Later, we’ll talk about what to look for when choosing the best rolling duffel bag for your needs. How do We Choose the Best Rolling Duffel Bags? Patagonia’s Black Hole is likely to be the best wheeled duffel of 2019. It is well designed, easy to use, a good volume for travel and extremely durable. It comes in a variety of sizes so you can choose the ideal capacity for your needs, and all are reasonably lightweight for their size. Freestanding even when half full. Daisy chains on the outside make attaching extra gear easy. Completely waterproof, rugged and durable. Well-placed grab handles make it easy to carry when not rolling. Ideally sized for hand luggage. Interior pockets are a little awkward to access. Capable of rolling down the most pot-holed of roads, this 40L bag is the best carry-on wheeled duffel bag for its balance of durability, ease of use and light weight. This one of the most popular wheeled duffel bags on the market right now and is a reliable choice for checked in luggage. This XL size is huge (128L), potentially unnecessarily so, but there are smaller options available. Designed to be carried as a duffel when not being rolled, it has padded carry handles and a shoulder strap (though it will likely be too heavy to carry like this when fully packed). Made of Bi-tech fabric which is abrasion resistant and weather-proof. Heavy duty treaded wheels mean this bag can be rolled anywhere. Incredibly lightweight for its size at just 5 lbs. There is no internal frame keeping the base of the bag stiff when it’s being dragged so it will roll exactly like a duffel bag with wheels on one end. If you’re not keen on this, you’d be better suited with one of the models that are more like wheeled suitcases below. 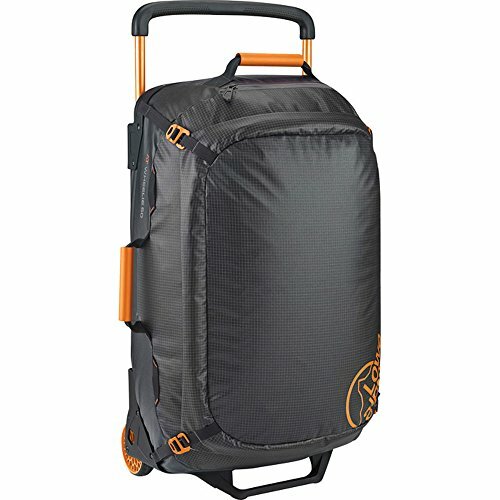 This is the best wheeled duffel for travel if you’re looking for something with large capacity that is very lightweight and durable. 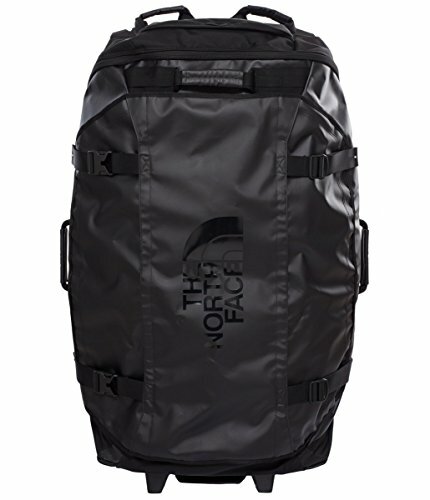 This 36” Rolling Duffel Bag by North Face is massive, and bomb proof. Made of super-tough base camp material, it is waterproof with extra plastic bumpers on high-ware areas. This is the bag you’ll want with you if you’re adventuring into far flung places with a lot of gear and want something that won’t let you down. Handles are ergonomically designed and make maneuvering this beast of a bag surprisingly easy. Large wheels with added tread are durable and will handle bumps in the road. This bag is free-standing which is not a common trait among duffels. There is no telescopic extending handle, as the bag is supposedly long enough to drag up-ended without needed the extra length of a handle. This may or may not work for you. 12 lbs. is a pretty heavy base weight. 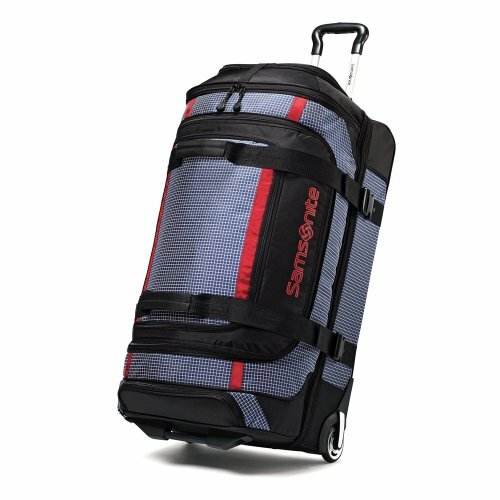 This is the best wheeled duffel bag for hauling a serious amount of gear if you want to make sure it stays safe and protected from the elements and baggage handlers. It is huge, and about as durable as it gets. To be honest, this is more of a soft shell wheeled suitcase than a duffel with wheels, but I suppose there is a fine line between the two. This bag is another biggie, with over 90L of capacity, but still manages to weigh less than 8 lbs. 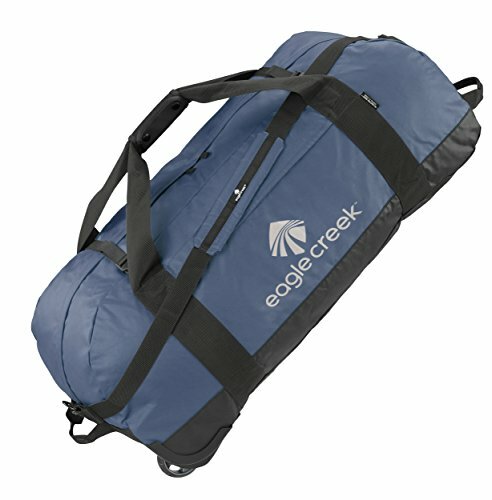 Covered by Eagle Creek’s No Matter What Lifetime Warranty. Large, heavy duty, treaded wheels and a tough aluminum handle. Flexible exoskeleton gives a little structure. The buckles could be more durable. 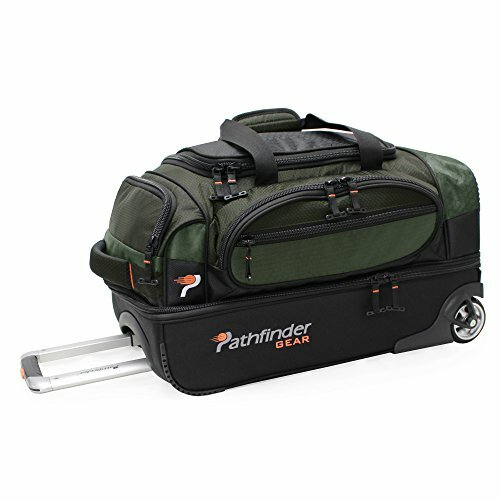 This rolling duffel provides a great volume to weight ratio with reliable durability. It doesn’t have the classic duffel bag handles but you probably wouldn’t want to be carrying this bag like a duffel anyway due to its size. This 27” wheeled duffel is well designed and made of top quality, durable materials. It has some unique features which set it apart from the field including a foot to make sure it balances by itself when upright, metal buckles, and a full width telescope handle. Made of abrasion resistant and water resistant TPU coated fabric. Secure, locking zippers and durable metal buckles. A good number of pockets and compartments for organization. No extra straps aside from the small grab handles for carrying. This is easily one of the best rolling duffel bags of 2019 and deserves more recognition for its top quality design. Osprey packs are well known for their durability and reliable design. This wheeled duffel and daypack combo could be the best wheeled duffel for international travel, providing the whole package of checked luggage and carry-on. Large wheels roll smoothly and easily. Comes with shoulder straps that pack into the back panel or can be removed for more internal volume. Good quality material is durable and water resistant. A small daypack is an included which can be attached to the front of the duffel bag or worn separately. You’re not going to want to carry this as a backpack for too long as it doesn’t have hip straps and won’t be particularly comfortable. Osprey have covered all bases with this bag, understanding that the convenience of being able to wheel your luggage needs to be balanced with the option of wearing it on your back when the situation calls for it. 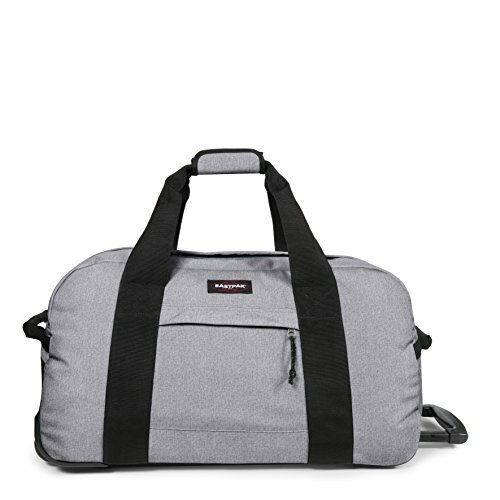 This is one of the best rolling duffel bags for travel. This bag is exactly what you picture when you think ‘rolling duffel’. It is literally a duffel bag with a couple of wheels and telescope handle, and it works. Its capacity is ideal for checked baggage without being unnecessarily huge, and the comfortable handles allow it to be carried off the ground when the situation calls for it. Smart grey material means this bag wouldn’t look out of place on a business trip. Padded handles are comfortable to wear on your shoulder. Limited pockets for organization, this is a legit duffel bag where everything goes in the main compartment. If a simple, well-made duffel bag that won’t break the bank is what you’re looking for, this Eastpak bag might fit the bill. This 26” duffel bag is a good medium sized bag for when you want to check your luggage but don’t want a huge monstrosity waiting for you when you get off the plane. It can easily fit all the personal gear you’d need for a reasonable length trip and is easy to roll, though it is a little heavy. Unzips completely into two halves in the style of a suitcase for easy access and organization of the interior. Telescope handle locks in place. Just over 10lbs. is a little heavy for the base weight. Only one set of zippers are locking which seems a little odd. This duffel bag is affordable and durable, but heavy. You’re not going to be able to carry it over your shoulder and the weight will eat into your baggage allowance. But it will survive all baggage handlers no matter what sort of day they’re having. This split duffel bag opens into two halves, and the top half has plenty of exterior pockets. It is the ideal size for carry-on luggage, weighing around 6 lbs. The top section can also compress making the bag even smaller when not filled to capacity. Very durable with a locking one-touch telescope handle. Larger wheels than most rolling luggage. Long straps allow it to be carried as a duffel as well as being wheeled. Maybe too big to use as carry-on luggage if you fill it to maximum capacity. This is one of the best carry-on rolling duffel bags. 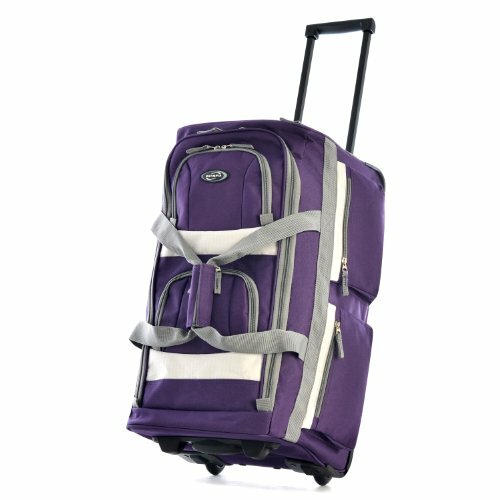 It is durable and easy to roll, with well-organized compartments. This is a deceptively spacious 22” duffel with plenty of pockets and a stable frame which makes it easy to roll. It is the ideal size and price for budget travelers looking for affordable hand luggage. Weighs just 5.1 lbs. making this one of the best lightweight rolling duffel bags. Suitable size for carry-on luggage. Numerous pockets help a lot with organization. Sturdy wheels and retractable telescope handles. Not freestanding and the handle doesn’t lock in place when extended so the bag can only be pulled. 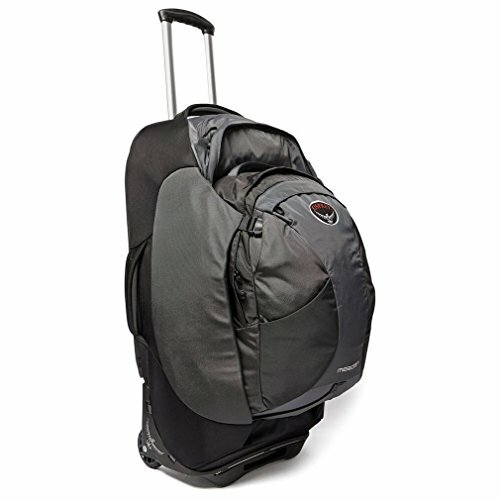 This is a conveniently sized and priced duffel bag with good quality wheels making it the best wheeled duffel carry-on for travelers on a budget. This is a very lightweight 22” duffel bag with a large ‘U’ shaped opening to the main compartment. The wheels and telescope handle are good quality and easy to use. The only downside is the overall durability, though that’s to be expected with such a low priced bag. Very affordable (a.k.a. ridiculously cheap). Padded carry handles give you the option of carrying like a regular duffel bag. At just a little over 5 lbs. this is very lightweight. Ideal size for weekend trips overland. Durability will be the main issue here, as with luggage it is a case of getting what you pay for. This rolling duffel is ideal for overland travel, being lightweight and easy transport. However, it probably wouldn’t stand up to the rigors of air travel many times. There are different things to consider when choosing the best rolling duffel bag for travel. A lot of it does come down to personal preference. But there are some things you may not have thought of. Mainly, you’ll want to be looking for a good balance of volume, weight and durability. For a start, the volume needs to be right for your needs. Too small and you won’t be able to fit everything that you need. Too large and you won’t be able to pick it up! The wheels are all well and good, but the whole point of this being a duffel bag with wheels is that you have the option of being able to pick it up when you need to. In general, 40L is ideal for lightweight travel and weekend trips with carry-on only bags. 60L is ideal for checked luggage. Anything above 60L is going to be getting pretty awkward to lift so you’ll want to be sure that you actually need the extra volume. Weight is a tricky one because lightweight can, unfortunately, mean low durability. But still, it pays to factor in the weight of the bag you’re buying, especially if you’re going to be flying. Durability comes down to material the bag is made out of, the strength of the stitching, the quality of the wheels and the fastenings (zips and buckles). It goes without saying that the more durable the better! Unfortunately, with bags such as these, it is a case of getting what you pay for. There are no shortcuts to durability, so it’s going to be the more expensive bags that win this round. Other things to consider include how easy it will be to organize and access your things, what extra handles are included, and how structured the base of the bag is. Organization essentially comes down to pockets. Are there any? If so, are there enough? I think a few separate compartments and pockets are always a good thing. Aside from liking my things to be organized, it can save a lot of time and rummaging if each thing has its place. Access comes down to how the bag opens. Does it unzip down the middle like a conventional duffel bag into one main compartment? Does it open in half like a suitcase? Or is the top one big flap that unzips to reveal the main compartment? In general, duffel bags are going to have better access than your typical backpack, but the specifics are going be personal preference. Handles make all the difference when it comes to carrying your bag up stairs or over muddy ground. I would even go as far as saying the more the better! Ideally, some grab handles on the sides and then a longer handle that gives you the option of going over your shoulder is a great combination. Structure (ie. whether or not there is a frame or stiff bottom panel) can be the difference between your bag’s belly dragging along the ground, or holding its shape. But, too much structure can result in a heavy, bulky bag. So, it comes down to balance. A little bit of structure is a good thing, but I prefer my bags to remain a little flexible so that they can be squashed into tight spaces if the situation calls for it. 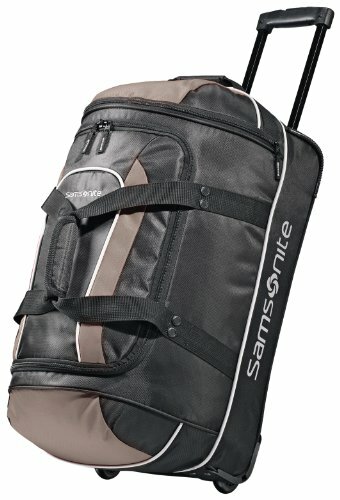 Overall, I think duffel bags with wheels are one of the best options out there for travel. They can allow you to pack more than in a backpack while being less bulky, more flexible, and of course, if you’re not in the mood to feel like a donkey, you can drag them behind you instead of lugging them on your back. The list above includes some top brands and a range of sizes and styles so there is definitely something there for everyone. We have a couple of other great articles on waterproof duffel bags and carry-on duffel bags so be sure to take a look at those if you’d like some more inspiration. Feel free to comment and if you haven’t already, go ahead and download a copy of our ebook on solo travel for some more essential tips.